As a member of Generation Rent who has put enough money in landlord’s pockets to cover a deposit and then some, my heart bleeds today for generally good egg Lily Allen. 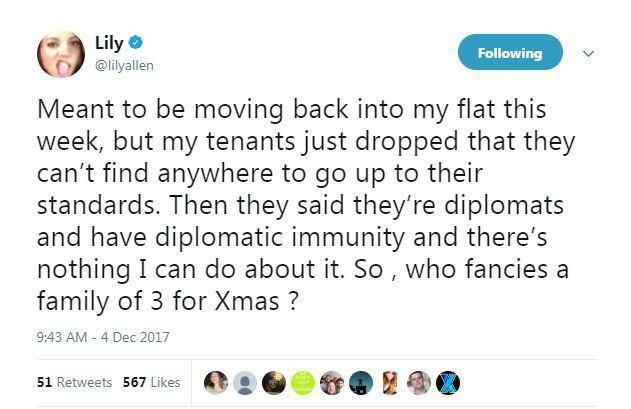 Turns out folks on Twitter have taken equally unkindly to the news that Lily will be left homeless this Christmas after tweeting and then deleting about how her tenants have refused to move out of her fancy London flat. I guess we should all start forming an orderly queue to get her to come and spend Christmas with us, now that she’s hit a festive housing nightmare which pales in comparison to the actual housing crisis that is affecting people across the country. Meant to be moving back into my flat this week, but my tenants just dropped that they can’t find anywhere to go up to their standards. Then they said they’re diplomats and have diplomatic immunity and there’s nothing I can do about it. So , who fancies a family of 3 for Xmas ? Way to rock those 140 extra characters we’ve got on Twitter! I swear your dad has a mansion? And what about your fella? I mean let’s be real you ain’t gonna be homeless unlike the majority whom are one payday away from being made homeless. So please don’t kick people in the teeth. Fans and non-fans alike put their characters to use to pour scorn and sarcasm on the pop star whose actor dad Keith lives in a mansion. The Sun took great pleasure in sticking it to Lily Allen for her double standards, after she stuck her head out of the parapet and apologised to migrants in Calais for Britain’s behaviour towards them last year, what with celebrities not being allowed to have humanitarian beliefs. Has to be the most ironic situation ever posted on Twitter. The Nan You’re A Window Shopper singer had been living in a Gloucestershire mansion with her estranged husband Sam Cooper and daughters Ethel and Marnie – however it’s believed the house has been put up for sale after Lily had a rough couple of years and ran into a rather hefty tax bill. No, actually a journalist turned up at the property and started harassing the tenants.